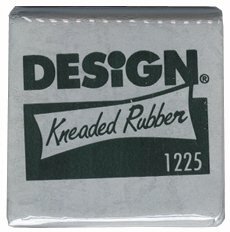 We really need our Kneaded Erasers! Not only are they fun to stretch, they are great for lifting up layers of charcoal, chalks, pastels, and graphite. These last longer than regular erasers because they do not leave behind all the eraser dust. After you erase a certain spot and you see the graphite on your eraser, all you need to do is pull and stretch the Kneaded Eraser until the graphite is gone. The fact that you can roll part of the eraser into a point comes in handy when adding highlights around your drawing of a face. Kneaded Erasers are sold separately in three different sizes and are available in packs which include a pink pearl eraser and a white eraser.